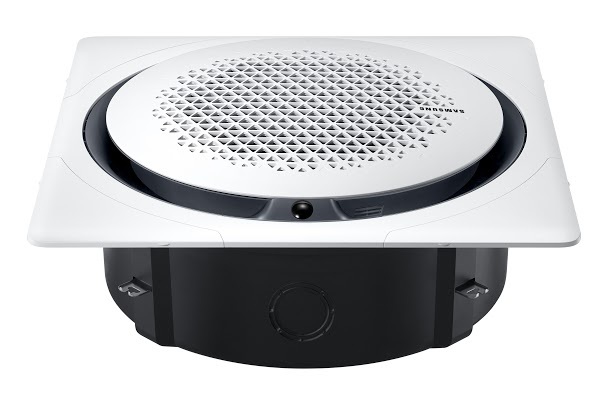 Samsung Electronics Co. Ltd., today announced the launch of the new 360 Cassette air conditioning unit with an omnidirectional airflow discharge, which eradicates cold air draft and increases cooling speed for a premium cooling experience. The groundbreaking bladeless circular design allows for even cooling with minimal loss in air flow, setting a new standard for multi-directional Cassette units. Unlike previous Samsung conventional 4-way cassette units, the cutting-edge design of the bladeless 360 Cassette delivers a zero angle airflow, which helps minimize airflow reduction by 25 percent*. With a temperature deviation of less than 0.6°C across an area spanning a diameter of 9.3m*, the new 360 Cassette from Samsung provides increased power efficiency without producing a cold draft, thereby delivering optimal cooling performance. Samsung’s circular air wave consistently controls the temperature of the room by providing an even distribution of air in a full 360 direction. Bladeless flow control ensures fast and comfortable cooling without the cold draft by ensuring 100 percent of air volume compared to Samsung 4-way Cassette units, which can lose up to 25 percent of air volume*. The cooling speed of the 360 Cassette is increased by 34 percent compared to Samsung conventional 4-way Cassette units. The 360 Cassette combines revolutionary performance with an elegant design which will blend in and enhance any setting. The unit features a stylish panel and an intuitive display that allows users to change the air flow depending on preference. Users can choose from three settings including horizontal, vertical, and separate zone control air flow. Easy to install, the air conditioner can also be fitted within the ceiling or exposed, offering ultimate flexibility to suit the style of any room. Users have the option of a wheel dial remote controller with a dedicated button for comfort cooling. The Samsung Virus doctor kit can also be added to reduce dust, airborne contaminants, allergens, bacteria and viruses.